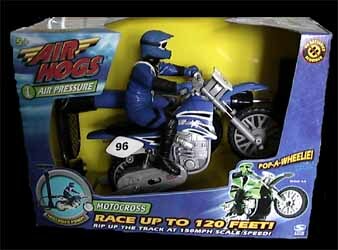 For those that are familiar with the Air Hogs range of vehicles, the Pop-A-Wheelie Motocross Bike will be a bit of a surprise. Air Hogs leaves the sky ("Air Hogs" describes the concept of compressed air as a propellant rather than the fact that the company's vehicles have all previously been air-based) and uses its technology to bring us land-based air propelled vehicles. I've never been a huge fan of air-based vehicles. While I recognise that the Air Hogs range of planes and helicopters have all been exceptionally great value for money, I'm more of a land-based vehicle guy. So, I was pleased to learn that Air Hogs have finally released something I could play with, without crashing into the ground every two minutes (yes, I am that uncoordinated). When I was a young lad (when the dinosaurs roamed the Earth... etc.) I had an Evil Knevil stunt bike. You slotted the bike onto a charger, wound the handle and sent it shooting off at breakneck speed. 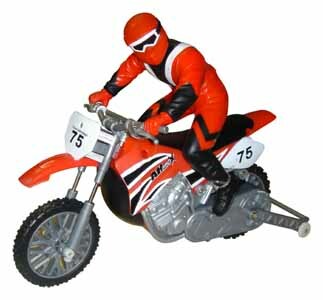 This Pop-A-Wheelie Motocross Bike reminded me of that old toy - although, obviously updated for a modern audience, and using much better technology. This vehicle is incredibly easy to use. Once the bike is secured onto its docking station, a pump fills an internal chamber. As the pressurised air is released, it powers an actual cylinder and piston engine. And, thanks to the inclusion of a wheelie bar, this bike can also perform cool wheelies. The bike is constructed of good solid plastic and will take quite a bit of wear and tear. Sad as I am, I really enjoyed making ramps for this toy. And, when you consider this is only £15 to buy, this is an incredibly cheap way to entertain the children in your family. They can even play with it indoors as a push along vehicle. What more incentive do you need to rush out and buy one? Other stockist of this item include: Toys R Us and all good toy shops.